Newport Beach, CA—Six years after its acquisition by Denver, CO-based Hyde Park Jewelers, Traditional Jewelers’ physical location will be rebranded under the Hyde Park banner. 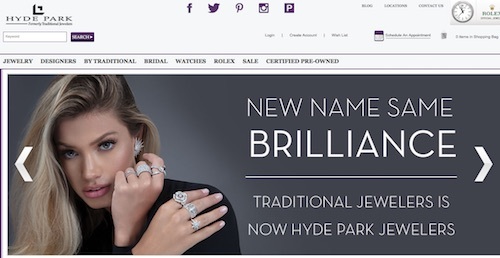 Its URL already leads to a Hyde Park Jewelers’ homepage, with a big announcement of the name change and “formerly Traditional Jewelers” slugged in the upper left. The luxury watch and jewelry boutique, a fixture at Newport Beach’s tony Fashion Island shopping plaza since 1991, was founded by Marion and Lula Halfacre, Mississippi natives who moved to California in the late 1970s. Traditional Jewelers became renowned for its exclusive collection of high-end watches and luxury jewelry, becoming the first “Cartier Corner” on the West Coast and adding more luxury jewelry and watch brands such as Patek Philippe, Rolex, Audemars Piguet, Chanel, Roberto Coin, Kwiat, and its own signature collection. Traditional Jewelers' URL takes visitors straight to Hyde Park's website, where the name change is announced and also slugged in the upper left corner. After Marion Halfacre died suddenly in 2007, Lula Halfacre operated the store for a time until selling it to Hyde Park in 2012. Hyde Park CEO Michael Pollack retained the Traditional name but through years of co-branding, now believes enough time has elapsed that customers—many of whom already shop at Hyde Park’s other locations—won’t be confused by the name change. Pollack had been longtime friends with the Halfacres, and a fellow member of the Luxury Jewelers Resource Group. After Marion’s death, he gently approached Lula Halfacre, promising that if she ever wanted to sell, he would uphold the store’s reputation for luxury and service. The two stores already overlapped 90% of their brands, so it wasn’t a stretch. After the acquisition was complete, Pollack doubled the size of the store but kept the Traditional name, although he began to incorporate the Hyde Park name into marketing materials and co-branding the store right away. Hyde Park has a total of seven locations, in Denver, Las Vegas, Phoenix, and Newport Beach. It also is undergoing a dramatic overhaul of its website this year to expand its online presence. New York, NY—Cartier, division of luxury conglomerate Richemont, is suing upscale specialty retailer Saks Fifth Avenue for breach of contract, claiming that Saks illegally terminated its lease for a shop-in-shop boutique at the Saks flagship on Fifth Avenue between 49th and 50th Streets in Manhattan. The suit further alleges that Saks plans to reallocate the Cartier space to another luxury brand after the renovations are complete. Cartier signed a five-year lease in 2016, but says the dust and debris from a major renovation of the Saks main floor has adversely impacted its business there. Saks—owned by Canada’s Hudson Bay Co.—claims it offered to move the Cartier boutique to another location in the store, but that Cartier did not like the proposed location and refused. Cartier says Saks then terminated its lease in violation of the contract and is asking for at least $40 million in damages and the lease to continue. Update: After this edition went to press, National Jeweler reported that Saks has countersued for $55 million and asked Cartier to vacate its Fifth Avenue flagship altogether, citing a new matrix of brands. Read it here. New York, NY—Jewelers for Children will hold its 21st Annual Facets of Hope event on Sunday, June 2, 2019 at the Venetian Las Vegas, in Las Vegas, NV, during the jewelry market week. The 2019 edition marks a return to the Venetian Las Vegas, along with the move of the JCK Show to the Sands Expo Center. The 2019 honorees are Judy Fisher, senior vice president of merchandising for Reeds Jewelers and David Bonaparte, president and CEO of Jewelers of America. The event will celebrate the success of JFC's fund raising efforts for the year, and commitments to its charity partners will be announced. In 2018, nearly 1,650 industry guests attended during the event. Both Fisher and Bonaparte have agreed to assist JFC in raising funds to benefit children who are the victims of catastrophic illness or life-threatening abuse and neglect. The event will begin at 6:00 p.m. with cocktails, followed by dinner and the program beginning at 7:30 p.m. It will be held on the fourth level of the Venetian hotel. Anyone interested in attending or sponsoring can contact JFC at (212) 687-2949 or info@jewelersforchildren.org. Details and participation forms are available on JFC’s website. New York, NY—The third Jewelry Industry Summit will convene on February 2-3, 2019 at the Tucson Convention Center. Hosted by AGTA, the Summit promises to be an opportunity to connect, collaborate, and generate plans of action to effect positive change to maintain and support sustainability in the jewelry supply chain. All in the trade are invited to share their perspectives, experiences and ideas to create an opportunity to improve responsibility and ethics in the creation and distribution of jewelry. This two-day interactive conference offers participants the opportunity to develop practical strategies and actions that can be taken now to sustain the community in which we all work. Insightful content from expert industry speakers combined with shared learning, brainstorming, and interactive discourse will create actions that can be taken today by designers, retailers and other participants. 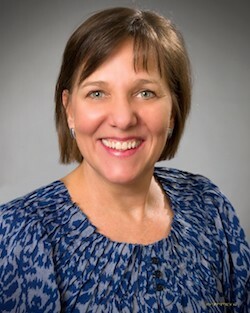 Summit board chair Cecilia L. Gardner said, “As we move into our fourth year, we have achieved much: status as a tax-exempt charity, two very successful regional events during 2018 in New York and Los Angeles, and many successful initiatives who will report their progress at the Summit in February 2019. We plan to gather our ambitious, knowledgeable and dedicated community in Tucson to continue our success. Sponsorship opportunities also are available and all donations are fully tax deductible to the extent allowed by law. The Jewelry Industry Summit is a not-for-profit charitable organization. Registration fee $275, with student and association discounts available. Hotel reservations available through AGTA. Visit www.jewelryindustrysummit.com for more information. New York, NY—Jewelers of America (JA) will be coordinating the launch of a consumer marketing program for fine jewelry in 2019. 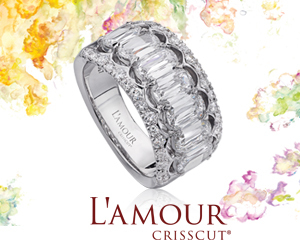 The campaign will be an industry-wide collaboration to increase consumer desire for jewelry and drive jewelry sales by promoting the unique and emotional aspects of jewelry ownership versus other disposable income purchases. JA is currently raising funds for a test campaign. The hyper-targeted, digitally-based campaign will run in a targeted region to allow the industry an opportunity to see the campaign creative in real time and establish key learnings before launching nationally. To raise funding, JA has established a “Pioneer Program” for those visionary companies who see the potential for the campaign success and want to contribute. Pioneer companies will be recognized through a variety of mechanisms, including press coverage, inclusion in trade advertising, recognition in all digital content related to the program, and recognition during the 2019 GEM Awards in New York. 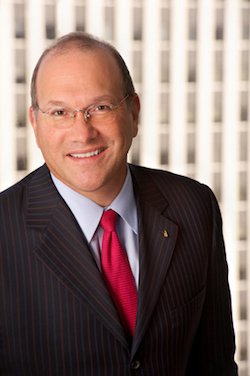 The current companies joining Jewelers of America in the Pioneer Program are: American Gem Society (AGS), Emerald Expositions, Forevermark, Gemological Institute of America, Gumuchian, Jewelers Mutual Insurance Group, JCK Industry Fund, Rahaminov Diamonds, Royal Chain Group, and Greenland Ruby. Carlsbad, CA—Researchers at GIA (Gemological Institute of America), in collaboration with researchers at the University of Padova in Italy, recently discovered a new mineral, which has been named in honor of G. Robert Crowningshield, a pioneering figure in gemological research for more than 50 years at GIA. Crowningshieldite was discovered as an altered inclusion in two diamonds from the Letseng mine in Lesotho. GIA research scientist Dr. Evan M. Smith publicly announced the new mineral at GIA’s annual research meeting and presented it at GIA’s International Gemological Symposium on Oct. 8. Crowningshieldite was accepted as a mineral on Sept. 18 by the International Mineralogical Association. Smith and his team of researchers discovered it while examining inclusions in CLIPPIR diamonds – a variety of type IIa diamond that forms at significantly greater depths than most diamonds. Crowningshieldite is a nickel sulfide mineral with a hexagonal crystal structure and can be regarded as the high-temperature polymorph of the mineral millerite. It is also the naturally occurring analog to the synthetic compound known as α-NiS. The mineral is proposed to have formed by alteration or chemical modification of originally metallic, polyphasic inclusions. These iron and nickel-rich metallic inclusions are the most prevalent type of inclusion found in CLIPPIR diamonds. G. Robert Crowningshield took GIA and the young science of gemology to new scientific heights. His first breakthrough came in 1956, when he discovered and documented the spectroscopic feature characterizing yellow irradiated diamonds. 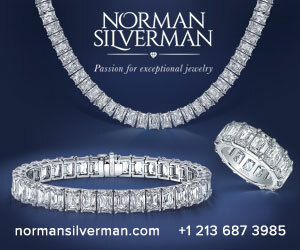 In 1971, he wrote the first report on gem quality laboratory-grown diamonds. His observations about the identification criteria for laboratory-grown diamonds discussed in that article, such as color zoning, metallic inclusions and uneven patterns of UV fluorescence, are still used today for diamond identification. Crowningshield is also recognized for reporting on many discoveries about pearls and colored stones. His 1983 landmark article described a naming convention for orange-pink “padparadscha” sapphires and he published more than a thousand brief observations in the regular Lab Notes column – that he originated in 1957 – of Gems & Gemology, GIA’s quarterly professional journal. Smith presented details about crowningshieldite at GIA’s sixth International Gemological Symposium, held Oct. 7-9 in Carlsbad, California. A specimen of the new mineral will be housed in GIA’s museum collection at the Institute’s headquarters in Carlsbad, California.